Along with cut daffodils, seeing bunches of fresh asparagus in the shops is a sure sign that spring is on the way. Needless to say, I bought both. I've yet to figure out a dish that would work for the daffodils (though admittedly, I haven't tried) so they reside in a vase to brighten up my mornings. The asparagus, however, barely lasted 12 hours before being made into the recipe below. This is actually surprisingly quick to make - I think it took me about 35 minutes from beginning to end - and the results are hopefully good enough to impress a date or serve up as a treat for a loved one. First, skin the plaice fillets and split into two lengthways - you should be left with four skinless long, thin fillets. Next, fill a pan with about an inch of water, add a pinch of salt and bring to the boil. While you're waiting for the water to boil, snap the tough ends off the asparagus and cut in half so you have twice as many, shorter spears. Once the water comes to the boil, blanch for two minutes and then refresh under ice cold water. This stops them cooking in their tracks and helps keep the lovely bright green colour. Preheat the oven to 200°C, then divide the asparagus into four piles, making sure you have a roughly even number of spears and stems. Next, wrap each pile of asparagus in a plaice fillet, making sure the side that the skin was on faces inwards. Tear off two squares of about 30cm tin foil and transfer two wrapped parcels to each sheet of foil, making sure they are close together. Add 1/4 of a teaspoon of tapenade to each fillet, and a place a thumbnail-sized knob of butter in each foil. Add a dessertspoon of lemon juice and 25ml of white wine to each foil, and then wrap them up, taking care not to damage the individual parcels. Lay each foil parcel on a baking tray and bake for 15 minutes. While the fish is baking, finely slice two shallots and gently fry them over a low heat until translucent. Add the garlic and fry for a further minute, then add the remaining white wine, lemon juice and a pinch of white pepper. Reduce until you have a thick jus, then stir in the capers. When the fish fillets are cooked, remove from the oven, carefully open the foil and then, using a fish slice, transfer the fish parcels to a warm plate. 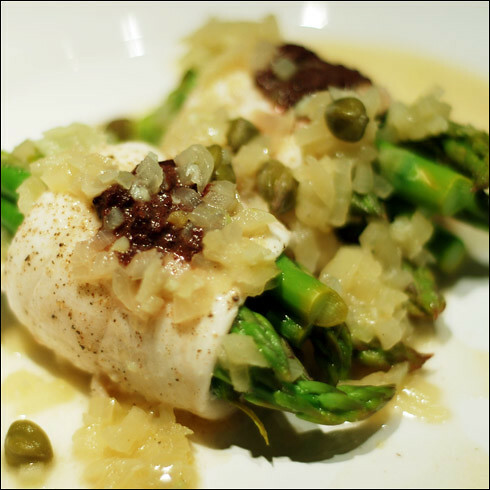 Add any liquid from the parcels to your caper and shallot jus, then spoon it over the fish. Serve with a green salad or fresh green vegetables.